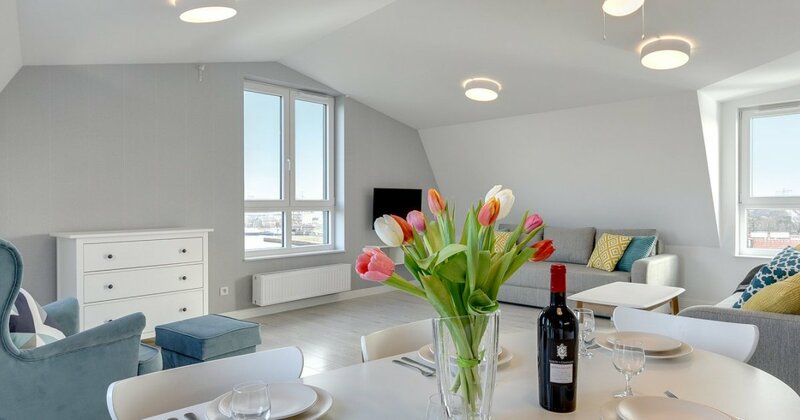 Quadruple Suite Apartment - comfortable and spacious, designed for up to 4 people, light and modern stylization of the apartment allows for a comfortable stay. Bright, fully equipped apartment designed to meet the daily needs of our guests. The apartment includes: a comfortable living area with a kitchenette , a dining table with chairs and a separate sleeping area with a large double bed, a separate bedroom with a double bed and a bathroom with toilet and shower. The view from the windows on the the historic architecture of Gdańsk is a decisive advantage of the apartment.